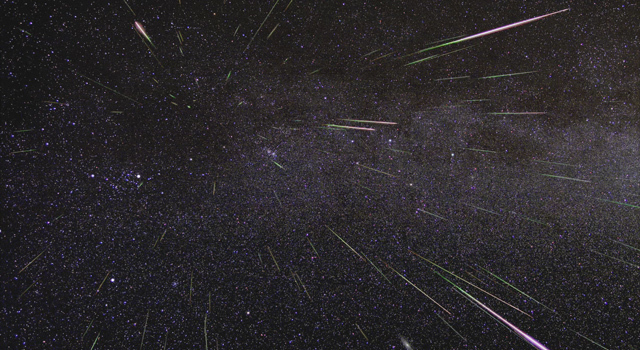 The Geminids Meteor Shower Peaks In Moonless Skies This Year! The annual Geminid meteor shower is back, and this year a moonless night promises a potentially stunning aerial light show for anyone inspired to stay up past midnight. In the North Bay, especially northward from Napa and Petaluma, there is less light pollution than in regions south. You don't need to go far to find dark skies here, in the rolling hills between valley cities or out toward the coast. In the East Bay, Mount Diablo is a good spot to consider. Though the gate near the top closes at sunset, there are spots along the roadside below the gate you can try. The Sunol area is also favorable since it is somewhat distanced from city lights and shielded by a range of hills. Along the Oakland-Berkeley-Hayward hills there are also some reasonably sheltered spots along roadsides, especially on the eastern side of the range. In the South Bay there is Henry Coe State Park. Not only is this a pretty good dark sky area, the park's gates remain open all night. On the peninsula south of San Francisco good viewing spots can be found along Skyline Blvd., especially west of the ridgeline. And of course, the Santa Cruz mountains provide some "wilderness" away from city lights, if you can find a spot without towering forests surrounding. Wherever you choose to view Geminids from, remember to dress warm, be aware of your surroundings, and use common sense to stay safe! This meteor shower will reach a peak in activity shortly after midnight on December 14 (early Thursday morning). If you plan to catch some Geminids, keep in mind that this night is the evening of December 13 going into the morning of December 14. 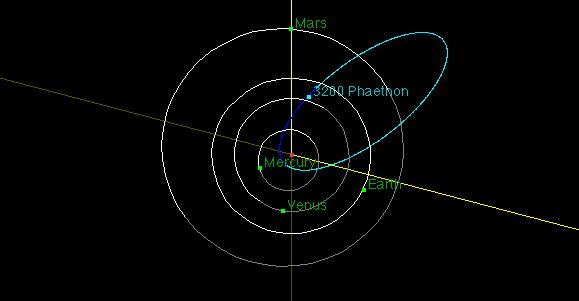 Named for constellation the meteors appear to radiate from, Gemini, the Geminid shower occurs when the Earth passes through a trail of dust left behind by the "rock-comet" 3200 Phaethon. This frozen ball of rock, ice and dust sheds a trail of fine debris along its orbit around the sun. The good news is that on this night, the thin waning crescent moon, setting shortly before sunset, will not be present and so moonlight will not hinder viewing. City light is another matter, of course, but if you can find a light-sheltered location where skies are darker, you may spot as many as 50 or more meteors per hour! The better news is that the Geminid shower is one of the most reliable meteor producers of any shower of the year. Away from urban light pollution, viewing rates may climb as high as 100 meteors per hour! When Are the Meteors Visible? The peak of activity for the Geminid shower occurs after midnight, roughly between 1 and 2 a.m. However, the geometry of the Geminid's dust trail and the moving Earth allows for the possibility of seeing some meteors before midnight. The constellation Gemini, marked by the twin bright stars Castor and Pollux, rises around 8 p.m., and you might catch a stray meteor flashing upward from the eastern horizon, or skimming close to the skyline to either side, before the stroke of midnight. 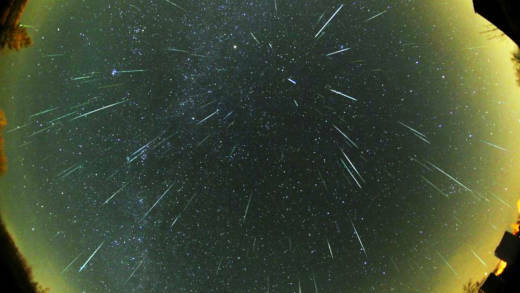 Pre-midnight viewing of Geminids is a special situation, and in general meteors associated with a shower are not visible until after midnight. This is because the side of the Earth that moves into the shower's dust trail falls under morning skies. If you imagine Earth moving through the dust cloud as a car driving through a cloud of insects, it's easier to understand why meteors only streak through Earth's forward-moving side. In a car, streaks of colliding bugs are only visible on the windshield, not the rear window. As the night goes on, Gemini will rise higher into the sky, and by midnight will be almost directly overhead. Keep your attention centered near Gemini, bearing in mind that, though the meteors radiate from this area, they can appear almost anywhere in the sky. If you live in the middle of a city, where even on a clear night you can see only a handful of the brightest stars, you still have a chance of seeing an occasional bright meteor—but you probably won't see many. Check out this dark sky map to see a heat map of light pollution around the San Francisco Bay Area. If you really want to see some dazzling meteor action, getting away from city lights, either by traveling a distance or finding a local "sheltered" spot, is your best bet. Keep in mind that a "light-sheltered" spot—a dark parking lot or side road shielded by trees or hills, but otherwise close to an urban area—will only be shielded from light coming directly from lamps, buildings, and so on, but is still subject to light pollution: urban light shining up into the atmosphere and bouncing from atmospheric particles back to Earth. We see a meteor shower when Earth passes through the trail of dust left behind by a comet--or in the case of the Geminids, a "rock-comet." 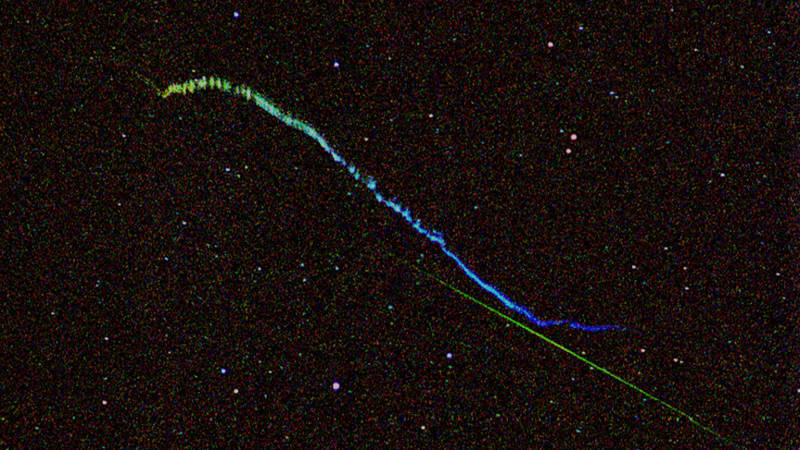 As the tiny particles of dust encounter Earth's atmosphere, they are quickly incinerated by heat of friction, and we see the incandescent trail they leave behind. These "shooting stars" move very fast across the sky, even though they are very high in the atmosphere: 50 to 75 miles up! Their speed is attributed to the orbital velocities of the Earth and the dust particles as they move around the sun. Earth itself is moving at 18 miles per second! A thing to remember when catching that quick, sometimes brilliant streak of light in the sky, is that it was produced by a tiny bit of dust or flake of rock or metal that has been drifting through the solar system for a very long time, either flying free or bound to a comet or asteroid. And now, its atoms are forever part of the Earth.